Generally, companies have found that solar panels can either be efficient or economical, but not both. This concept has recently been challenged by a team of researchers at the Ira A. Fulton Schools of Engineering. They coupled two solar technologies, moving one step closer to creating more economical and highly effective solar panels. The team had one specific challenge: Solar panels were costly as silicon was used, but were more efficient than the affordable thin film solar cells made from cadmium telluride. The ASU researchers were led by electrical engineering professor Yong-Hang Zhang and assistant professor Zachary Holman. They discovered a way to add a small quantity of silicon to the thin film cells, integrating the features of both panels. For the first time, thin film cells based invention beats the efficiency record and accomplished maximum open-circuit voltage. The research findings were published in the Nature Energy journal. A solar cell’s ability to pump electricity around a circuit is measured by open-circuit voltage. When a solar cell absorbs light, a high voltage is generated, and this excites electrons by shaking them away from their atoms. Then the electrons form on one side of the solar cell, similar to a battery’s negative terminal. A major challenge in building a high voltage solar cell is that the excited electrons are lost nearly as soon as the sunlight reaches a solar cell. The team’s goal is to extract the electricity before it is lost. According to Zhang, an associate dean for research in the Ira A. Fulton Schools of Engineering, this can be achieved by adding conductive contacts to the bottom and top of a solar cell. The traditional contacts are made through introducing impurities in the solar cell absorbing layer, which can degrade the device performance dramatically. Instead of an impurity, Zhang, Holman and their teams further added an individual contact layer of economical amorphous silicon. This helped them achieve a solar cell with a voltage of 1.1 V, which has never been recorded before. “Essentially, we’ve created a solar cell that allows for the maximum number of electrons possible to build up before extracting them quickly and efficiently out the ‘smart’ contact,” Zhang said. Apart from achieving a high voltage, the cells also achieved a 17% efficiency, creating a new record of 15.2% for thin film solar cells. Although solar cells made using silicon possess about a 25% efficiency rating, the feat achieved by thin film has potential for extensive usage. Zhang is aiming to reach a 20% efficiency or more in the future. The important thing is that this material system has been proven cost effective, but (until now) never efficient enough in terms of energy production to take over the solar market. Many times with a paper such as this, the findings are either scientifically interesting or commercially applicable, but not both. However, these results are. Although silicon solar panels control the market, there are about 10 GW of thin film solar panels used around the world which is adequate to power 2.5 million homes. The largest manufacturer of thin-film solar cells is First Solar in Tempe, Arizona. These latest results further confirm our long-standing conviction that cadmium telluride is an ideal material choice for photovoltaic application. Reaching an open-circuit voltage of 1.1 volts is a milestone for the technology and provides confidence that thin-film CdTe has not reached its limits. The alliance between Zhang and Holman’s separate teams proved to be successful. Although Zhang and his team were the first to conceive the base idea of these innovative solar cells, it took almost two years to enhance the materials required to fabricate them. They then required Holman’s know-how in silicon solar cells to enable the blending of two highly diverse semiconductors to attain exclusive and efficient properties. Holman and Zhang plan to collaborate in the future to gain from each other’s expertise. We’re exploring the possibility of developing a tandem solar cell, basically two complimentary solar cells that would stack on top of one another, further boosting efficiency. The two teams will be presenting their recent results at the Photovoltaic Specialists Conference at the Institute of Electrical and Electronics Engineers in Portland, Oregon. The U.S. Department of Energy’s Bay Area Photovoltaic Consortium (BAPVC) funded the research. BAPVC is made up of universities, government, and industry, who are keen on enhancing photovoltaic technology. It is headed by the University of California Berkeley and Stanford University. 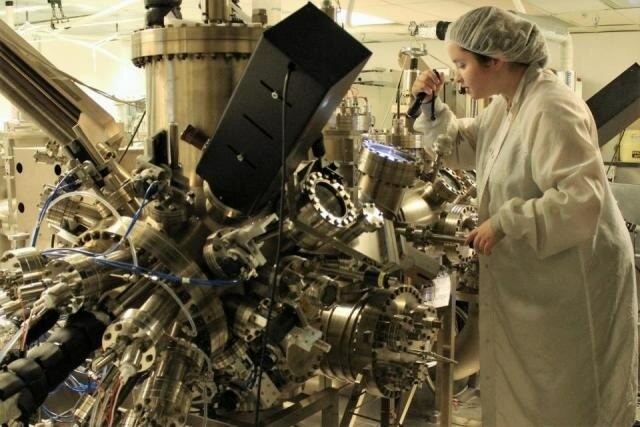 Quantum Energy and Sustainable Solar Technologies (QESST), one of the four National Science Foundation-funded Engineering Research Centers at the Fulton Schools at ASU, also provided funding support. According to Zhang, in 2007, the Science Foundation Arizona was the first to offer their support. Then over the last 10 years funding was provided by the National Science Foundation, the Air Force Research Laboratory, the Army Research Office, and Air Force Office of Scientific Research.